Disney's original mountain, home of Harold the yeti. The world's first tubular steel track roller coaster and Disney's first mountain. The Matterhorn has never been replicated (yet anyway) at any other Disney park, though Walt Disney World's Animal Kingdom has a great cover-version known as Expedition Everest. I'd be hard pressed to say which I enjoyed more, the simple fun of the original or the big thrills and high-tech yeti of the newer version. Which one I'd rather draw, though, is easy: I love the look of the white-furred, blue-faced original yeti. And so: here's the Matterhorn! Oh, and the guy climbing the mountain on the side? They used to have guys actually do that in Disneyland every day. To see a larger version, visit my DeviantArt account. Soon, my hometown of Ann Arbor, Michigan will soon have its own roller derby league. My wife Christa and I are both pretty excited about this and look forward to going to see tough girls slamming into one another at high speeds as soon as things get rollin'. If anybody is interested, I'll let you know where you can get the shirts once they're available. Support local fun! Disney attraction portraits #2: The Haunted Mansion. "When hinges creak in doorless chambers and strange and frightening sounds echo through the halls, whenever candlelights flicker where the air is deathly still, that is the time when ghosts are present, practicing their terror with ghoulish delight!" Welcome, foolish mortals, to my Haunted Mansion attraction portrait. 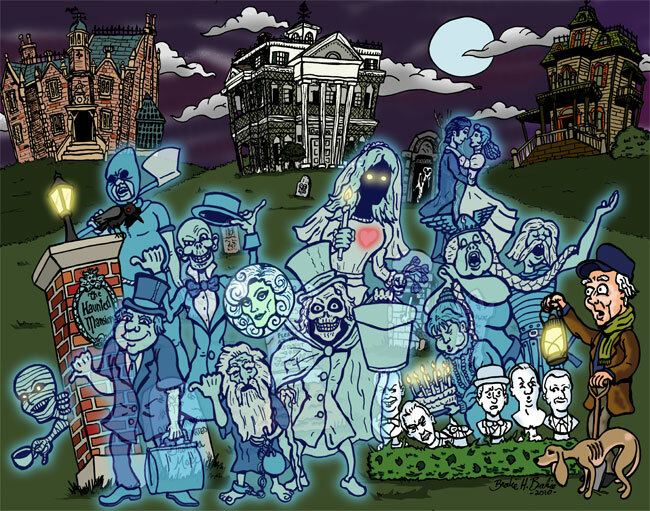 A handful of the attraction's 999 happy haunts have come out to socialize with you, including the famous hitchhiking ghosts, the mysterious hat box ghost, and the original version of the attic's beating-heart bride. In the background are (from left to right), Walt Disney World's mansion exterior, the Disneyland original, and the Disneyland Paris ride remix known as Phantom Manor. As you can probably tell, this is a combination of two physical drawings, one drawing of anything that's a solid object (the caretaker, the singing busts, the graves, etc.) and another of just the ghosts. Put them together, adjust the opacity of the ghosts, and taa-daa: see-through apparitions! 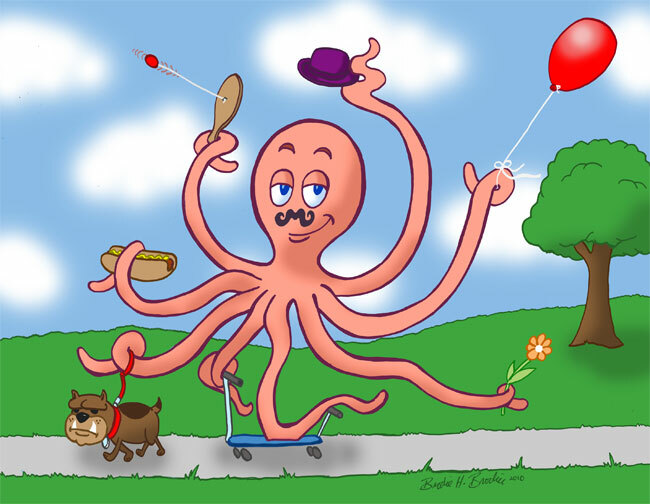 Sometimes you just feel like drawing an octopus wearing a fake mustache taking his dog for a walk while riding a scooter, enjoying a hotdog, picking a flower, doffing his hat, playing paddleball, and carrying a balloon. I think everyone feels like that sometimes.